A lot of things have been 3D printed over the years. Drones. Hair. Dog noses. Buses. Bones. And now we can add one more item to the list - human skin. 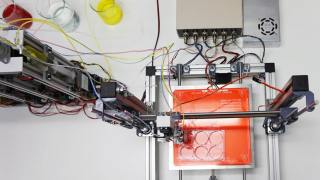 Biologists at the Universidad Carlos III de Madrid have built a prototype of a 3D bioprinter that can create totally functional skin. The output is good enough, the team says, to be used in transplants, or in testing of cosmetics and chemicals. Making skin isn't easy because of its structure. An external layer (the epidermis) protects against the environment, while an internal layer (the dermis) produces collagen - the protein that gives the skin elasticity and mechanical strength. “Knowing how to mix the biological components, in what conditions to work with them so that the cells don’t deteriorate, and how to correctly deposit the product is critical to the system,” explained Juan Francisco del Cañizo, who worked on the project. For industrial purposes, the ingredients come from a stock of cells created at large scales. “We use only human cells and components to produce skin that is bioactive and can generate its own human collagen, thereby avoiding the use of the animal collagen that is found in other methods,” say the researchers. But to create skin for an individual their own cells are harvested so that the resulting skin is biocompatible and won't be rejected. “This method of bioprinting allows skin to be generated in a standardized, automated way, and the process is less expensive than manual production,” said Alfredo Brisac from BioDan Group, a bioengineering firm that collaborated with the researchers. The full details of the bioprinter were published in the journal Biofabrication. Latvian snowboarders have taken up "droneboarding"